When it comes to weddings, knowing exactly what to wear can be quite tricky. Finding something not too short, not too colorful or inappropriate can take a while, but you are guaranteed to get inspired from these 30 stunning wedding looks, featuring both traditional, elegant wedding guest looks and more creative, youthful outfits as well. You can never go wrong with a beautiful shade of pastel, mixed with a classic T-shirt dress design and delicate lace material. We love the accessories of the look and how it is kept all-pink with a pretty pink, fringed clutch. For hair and makeup, keep it soft with mauve lips and wavy locks. If you’d like to try something out of the box and edgy, yet still elegant and appropriate for a wedding, look for a beautiful jumpsuit. There are no limits in colors and shapes: palazzo pants, low-cut tops, and strappy jumpsuits are all really popular this season, and for color, we recommend trying a teal, baby pink or mint colored one. If you are going to a more formal wedding, add a beige or tan blazer on top. This long sleeved, baby blue maxi dress is perfect for beach weddings and more boho chic themed events! Because of its silhouette and material, it is not too serious or formal, especially if you pair it with beachy waves and a gladiator sandal, but to make it more elegant, you can add a sleek bun and a pop of burgundy on your lips. 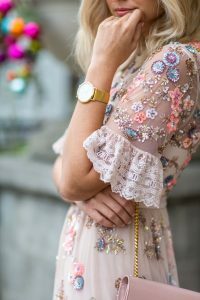 If you don’t have a wedding-appropriate dress, mix and match tops and skirts from your wardrobe and get inspired by this beautiful, pink and floral outfit. This outfit features a low cut, baby pink top with a high waisted, floral pencil skirt. Although the top is more casual, it balances out the formal vibe of the pencil skirt. Although it is not advised to wear bright red on a wedding, a beautiful pop of maroon mixed with cherry blossom print and lace can be the perfect wedding outfit. Because of the romantic fabrics and prints, it’s not an over the top look, and it’s just the right amount of playful and elegant at the same time. If you don’t want to choose the regular, light pastel pink dress, make it more interesting by choosing and embroidered, beaded one. Besides it looks absolutely stunning, it also has a romantic, fairytale-like vibe that will match a wedding perfectly. If you have a beautiful white top that you’d like to wear, make sure to mix it with different colors you don’t end up being all-white. One of the ways you can turn a white top into the perfect wedding guest outfit is by adding floral prints or lace textures to your outfit. For a more casual wedding (where you don’t have to be very elegant and romantic), choose a more edgy and modern version of the traditional top and pencil skirt combo. This outfit is very minimalistic, yet still appropriate for a wedding with its color scheme. A more elegant and formal version of the very first dress is this pink lace overlay pencil dress. From its neckline and silhouette to the different materials and pretty shade, it looks like it was created for a wedding. Match it with pastel accessories, such as a mint bag for a gorgeous spring wedding look. Teal is a very popular wedding shade: unlike the traditional pastels, it’s a bit more fun and edgy, but not too eye-catching, and with the draping of this dress and unique neckline, you are guaranteed to be the best-dressed guest. 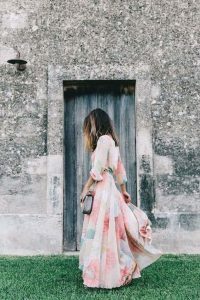 Mixing chiffon, floral and maxi length is probably everything you’ll ever need for a boho chic spring or summer wedding! Match it with braids and a soft smokey makeup look to get that true wow effect. A leather jacket for a wedding is definitely a risky choice, so we only recommend going with a leather jacket (even if it has a more elegant silhouette) after consulting about it with the bride. On the other hand, the beige pleated midi dress underneath it looks stunning, especially with gold waist belt. Maxi length palazzo pants will give the illusion of a long skirt, but with an interesting twist to it. Besides the shape of these pants, we also love the creative color combination of yellow, purple and blue. Emphasize the floral vibe by adding a flower accessory in your hair. If you want to wear a fun, white mini dress, make sure to choose a colorful blazer and accessories to make it more vibrant. This outfit features a coral pink blazer and beige accessories, but a white dress can also look amazing with a mint or yellow jacket/cardigan and matching accessories. You don’t have to stick with the regular floral prints if you want something more bold and daring – geometric shapes are also great for experimental fashionistas, and because of the romantic flare of the midi skirt, it is perfectly appropriate for a wedding. With maxi dresses, you can always have fun with tasteful cutouts and adding floral prints. The most beautiful part of this dress has to be the backless cut out mixed with the burgundy and maroon flowers…we are in love! One of the most popular wedding guest silhouettes is the wrap midi dress, and we completely understand why so many girls choose it. It’s just the right amount of conservative with fun elements, while the waistband and the usual, asymmetric cut of these dresses will emphasize your figure. 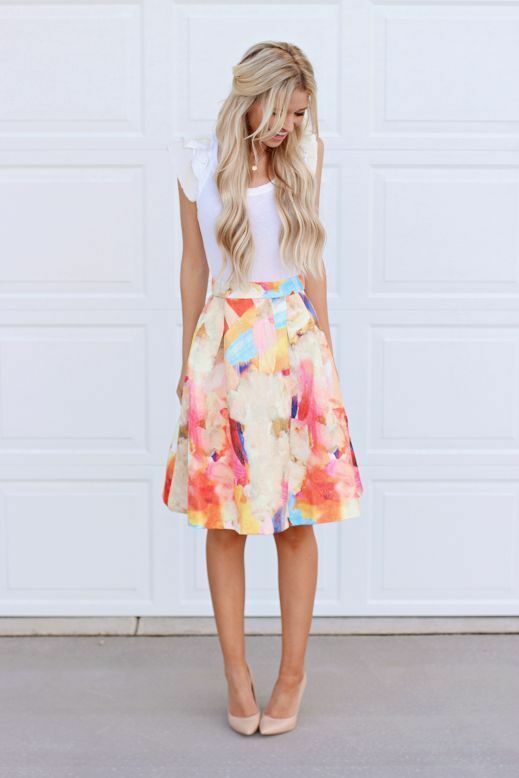 If you are going to a fun, spring or summer garden wedding, this outfit could 100% work. The huge, baby pink and hot pink roses with the strapless, sweetheart cut and the voluminous skirt looks so amazing! Another beautiful, minimalist outfit: a draped, asymmetric taupe dress with a waist belt. If you choose a satin or silk material, you can make this outfit even more romantic. Looking for something bold, but not a fan of pink? Yellow is probably the perfect match for you – if you know the wedding is going to be more colorful (such as a summer wedding), choose a yellow top or skirt with neutral accessories! For this season, we are completely in love with sunflower prints and hair accessories. There is something so beautiful and timeless about this shade of blue! While it’s not too daring, it’s definitely different from the regular baby blue shades, and with the lace and midi design, it is a great choice for any wedding, whether it is more formal or casual. An off shoulder, orange or coral dress with frill detailing is perfect for beach weddings or smaller, country weddings. While it has romantic elements, it’s also a bit more fun than a traditional lace dress. If you choose a mini or midi length, there is nothing wrong with wearing tulle to a wedding! We love how this outfit brings together a fun blue shade with floral embroidery and a tulle overlay. This outfit would look stunning with pink lips and a bold eyeliner! If you decide to go with metallics, such as rose gold, gold, silver or bronze, make sure to keep the rest of the outfit minimal and choose traditional, formal silhouette with simple accessories. What makes this outfit really special is the classic vibe with the blazer and pencil skirt. If you usually have an elegant style, you might want to look for something more interesting than a pencil skirt – and in this case, you will definitely like structured dresses, like this pleated beauty. Although it has a low cut, which might be too risky for a wedding, it is a really classy and elegant dress that can be easily accessorized with any other color. 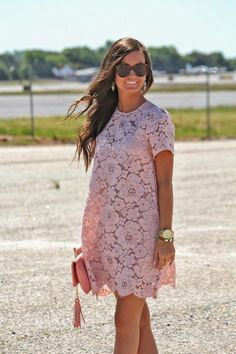 A long sleeved, simple silhouette lace dress is always a good choice, especially if you are going to match it with pearls and other statement jewelry. For this look, we recommend either leaving your hair wavy or straightening it, while keeping your eyes and lips very natural. If you know the couple really well and know that there are no rules when it comes to fashion, rock a pink maxi skirt with a floral top! The only thing we would change in this outfit is the black top, but with any other floral top, this look will be a stunning choice for a wedding. Experiment with mesh, tulle overlays, and embroidery! 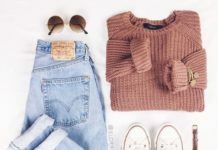 The trick with these outfits is to choose a neutral base color, such as pastel pink, beige or mint, so you won’t be too over the top. A modern version of pantsuits, mixed with a boxy, off-shoulder top and wide leg pants: an absolute must-have for fashion lovers! To show off your girly side, mix and match different pink shades and keep your look classy with a floppy hat and beautiful statement belt. If you don’t want to be too pink, try pairing a pastel shirt with a mauve skirt or a hot pink top with beige pants/skirts.